Every winter we work hard to ensure the animals have access to water. With several animal pens, this can be a challenge. It can be frustrating to refill a water bowl with fresh water only to have it freeze in a matter of hours. Here are some tips we’ve learned along the way that may help you. In the morning I used to go out to the pens and worry the animals would be dying of thirst, so I filled their water bowls and buckets to the brim. In the afternoon I checked on everything, and find 90% of the water I poured in the morning was untouched by the animals, and now I had a huge ice block to knock out of the bowl or bucket. It’s taken me a while to realize I should just pour less water! So now I fill the water bowls and buckets with how much I expect the animals to use based off of past consumption. This leads to a lot less waste and saves me time! 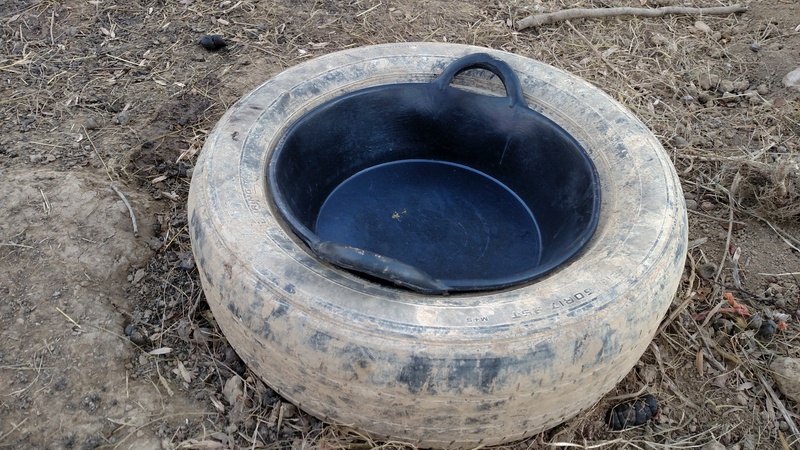 We have a good supply of rubber pans and buckets for winter water use. The rubber material is more flexible in cold weather than plastic is, so I can knock out frozen water without breaking the container. 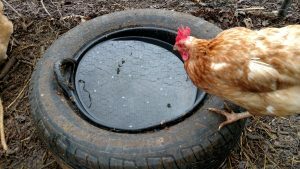 We use low rubber pans for chickens, ducks, pigs, and the rabbit colony. We use rubber buckets for goats. These items can be purchased at Tractor Supply or your local feed store. They’re not expensive, either! In cold weather we check all the animal pens in the early afternoon, and kick the water containers to break any ice that’s formed. It gives the animals a few more hours to drink the water. In the evening, if we’re going by a water bowl to lock up chickens or ducks in their coops, we’ll go ahead and dump any remaining water at that time. It’s easier to dump the water/slush then compared to in the morning when it’s frozen solid. Now I don’t think this is worth a separate trip to the water bowls, but it’s worth doing if you’re there anyway. We were passed along a tip to keep water from freezing in cold weather. The secret is put the rubber water pan inside a tire. The tire helps insulate the water pan so the water doesn’t freeze as easily. We’ve given this a try this winter, but I can’t say whether or not I like it yet. The few sub-freezing days we’ve had have been really cold, so all the water pans are freezing whether they’re in a tire or not. The pans in the tire are notably more difficult to turn over and dump out. The pan is stuck in the tire, so we have to turn the entire tire on its side and kick the pan to get the ice out of it. We’ll see if this seems helpful over a longer period of time. I hope these tips help you on your homestead as you deal with winter weather!